More good news today! This afternoon was the consultation with my oncologist to get a little more information on what the MRI showed. As I said before the MRI showed that the tumor has shrunken a little but more than anything it has stopped growing. The meeting also have us more of an insight into how the rest of my brain was reacting to the tumor. When I had my very first MRI, one of the side effects of the tumor was that it was causing the fluid pools in my brain to build up. This along with the pressure the tumor, double vision, and of course the tumor, was not creating a good situation for my brain. 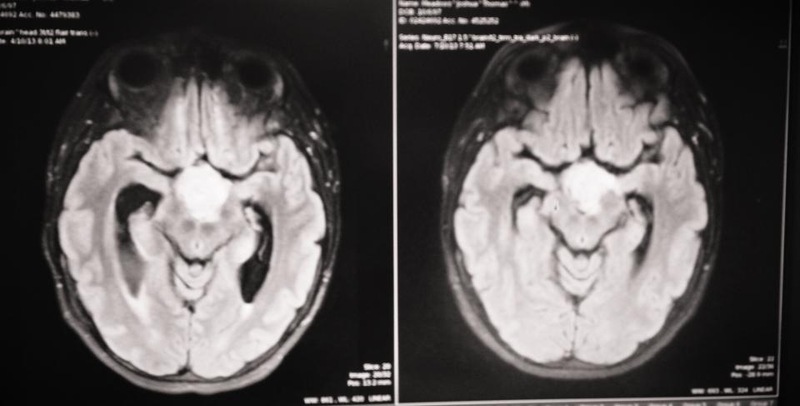 This most recent MRI shows that the fluid pools in my head have been draining normally and that there is no longer buildup. One of the things my oncologist did talk about is how I’ll be getting MRIs for the rest of my life! Over the next year I’ll be getting an MRI every three months. Once the treatment is over then I’ll be getting an MRI every six months for the next five years, and finally after that I’ll be getting one MRI every year for the rest of my life. Fun, right?! In the image below you can see the tumor is the giant white growth in the middle. The fluid pools are the two black areas on each side of my brain. As you can see in the second image, they are much smaller. You can also see that the tumor is a bit smaller. As you can see here the fluid pools have reduced and more than anything the tumor is a bit smaller! All in all we received a lot of good news today. I want to take another moment to thank everyone who has been following my journey and sending so much greatly appreciated support. Josh – I’m so happy that the tumor has gotten smaller, as well as the fluid pools! What wonderful news! You are such an inspiration to us all. Your positive energy and outlook is contagious and I’m sure that these characteristics have also helped fight this cancer. Hope that you all are enjoying your vacation! I cannot wait to be down at GDS in the fall. Thank you for all your support, and I’ll see you soon!